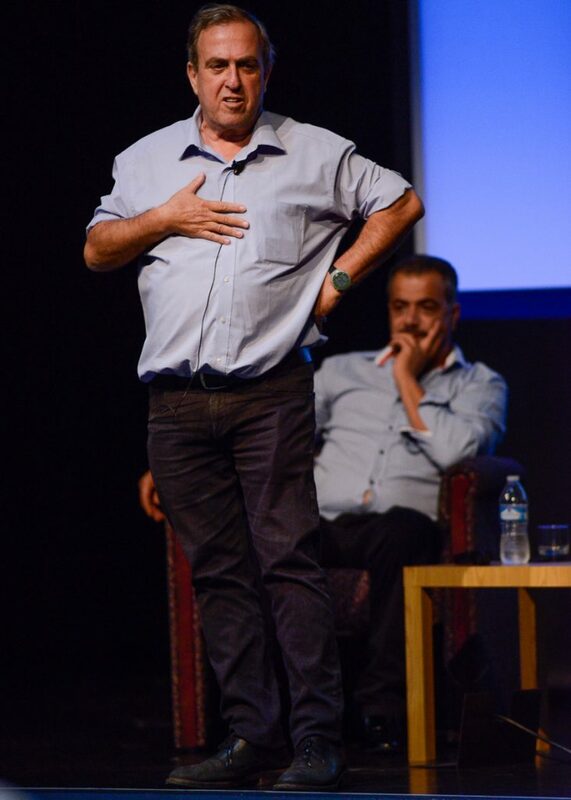 Rami Elhanan and Mazen Faraj shared their stories of loss and their unique choice of reconciliation at the Parents Circle Families Forum in September. In the midst of their grief and anger, more than 600 families who have lost loved ones to the Israeli-Palestinian conflict are seeking reconciliation over revenge. The Parents Circle Families Forum (PCFF) brings thousands of these bereaved families together on their personal journeys of reconciliation. It is often raw and always emotional, but out of these interactions, comes change. Not the kind of change that makes headlines, but a more personal and profound shift in perspective. 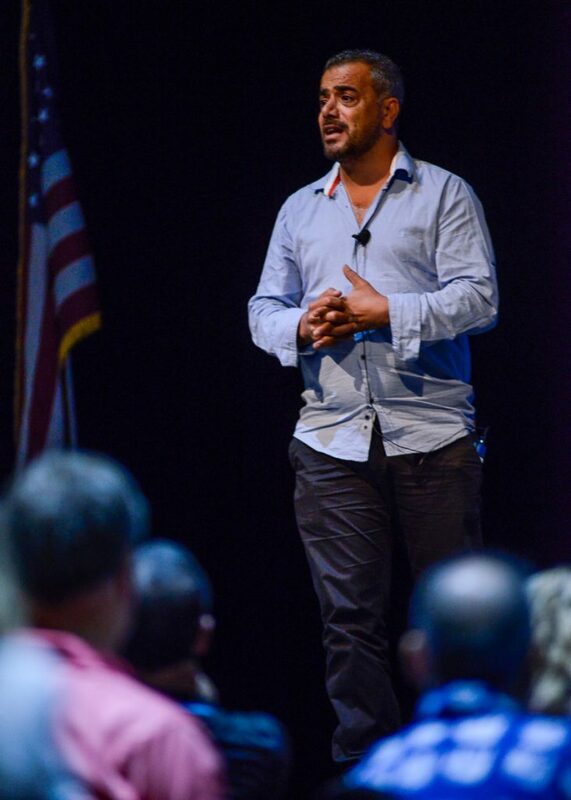 The Jewish Federation of Cincinnati’s Israel Center and Jewish Community Relations Council (JCRC), along with Entrepreneurs’ Organization Cincinnati (EO), hosted Rami Elhanan, who lost his daughter, and Mazen Faraj, who lost his father, at the Mayerson JCC in September. The two men shared their stories of loss and their unique choice of reconciliation. Below are some reflections from those who attended the event. 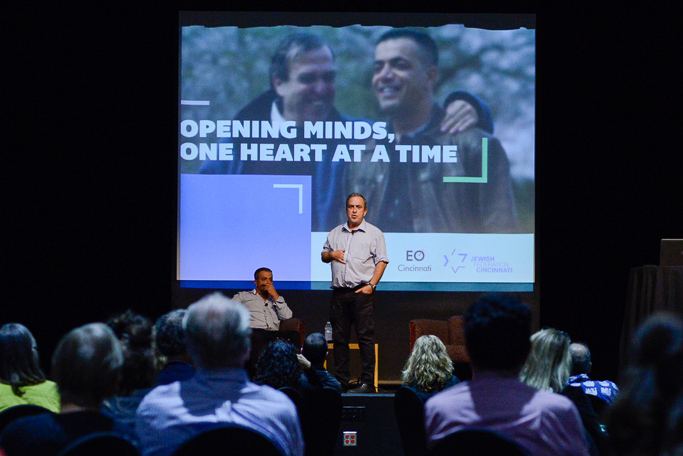 Rami Elhanan, who lost his daughter in the Israeli-Palestinian conflict, shares his unique story of reconciliation. The Jewish Community Relations Council serves many different purposes. We represent the Jewish community in larger civic circles. We work with leaders of other faith and ethnic communities on issues of shared concern. But at the very core of our work is what we experienced at the Parents Circle Families Forum event—creating spaces for conversation across differences that moves people forward. These men have suffered unthinkable loss. They have every reason to distance themselves from one another. But they have made an intentional choice to do just the opposite—because they realize that their past, present, and future are bound up together. And that the only way forward is together. Mazen Faraj, who lost his father in the Israeli-Palestinian conflict, shares his unique story of reconciliation. I came with great hope that the progress these two men have made could be extended to two whole groups of people. I left feeling defeated, like the chasm is too great to close. These two men have made a huge and tremendous journey, bridging the hatred and the great abyss between the Israeli Jews and the Palestinians. They have paid the highest price of the conflict. As an Israeli who grew up and has lived his entire life amidst this conflict, though, I was tuned in to the seemingly small details folded into their stories. My heart sank from sorrow realizing Mazen that when goes back home to the Dahaisha refugee camp, no one is willing to listen to him. He is isolated within his own people, who consider even talking to Israelis treasonous. And his Israeli partner, Rami, identifies with the Palestinians and the challenges they face. His plea, again, falls on deaf ears.